Monster whitetail bucks aren’t found living everywhere. The same is true of bruiser bluegills. Seemingly every lake in Michigan has a population of bluegill, but only select waters routinely produce the kind of bluegill anglers can brag about catching. WHAT MAKES A GREAT BLUEGILL LAKE? The first question becomes, why are so many seemingly good panfish lakes jam packed with stunted bluegills? The answer lies in the balance between predator and prey. Not enough predators in a particular body of water allow bluegills to breed and expand their populations uncontrolled. As the bluegill population grows, serious stress is placed on the lake’s ability to supply enough food for all those bluegills. Lack of food causes growth rates to crawl almost to a stop, leaving lakes supplied with lots of bluegill, but nearly no adult sized fish. Once this cycle begins it’s very difficult to break free from a misbalanced predator/prey relationship. Ironically, lakes with a healthy population of primary predators like largemouth bass, smallmouth bass, walleye or northern pike, have a much greater opportunity to grow quality bluegills. These important predator species keep panfish numbers in check and allow the surviving members to grow rapidly and to larger size. The formula for growing big and large numbers of bluegills isn’t just about having a balance between predators and prey species. A lake must also provide ideal habitat in terms of both spawning grounds and places for bluegill to live and feed during the rest of the year. Fertile lakes with lots of organic soft bottom regions that support weed growth is critical to bluegill success. The aquatic insects, scuds and small crustaceans that bluegill depend upon favor fertile lakes with lots of muck, dark bottoms, weed growth along with a sprinkling of sand or gravel areas for spawning. Where this firm bottom spawning substrate is located is also critical. In lakes where the spawning water is found in the shallows where the beds are easily spotted by anglers, spring fishing pressure takes a major toll on the adult bluegill population. In lakes where the bluegill can find suitable spawning habitat in a little deeper water, anglers have a much harder time finding the beds and selectively catching adult fish. 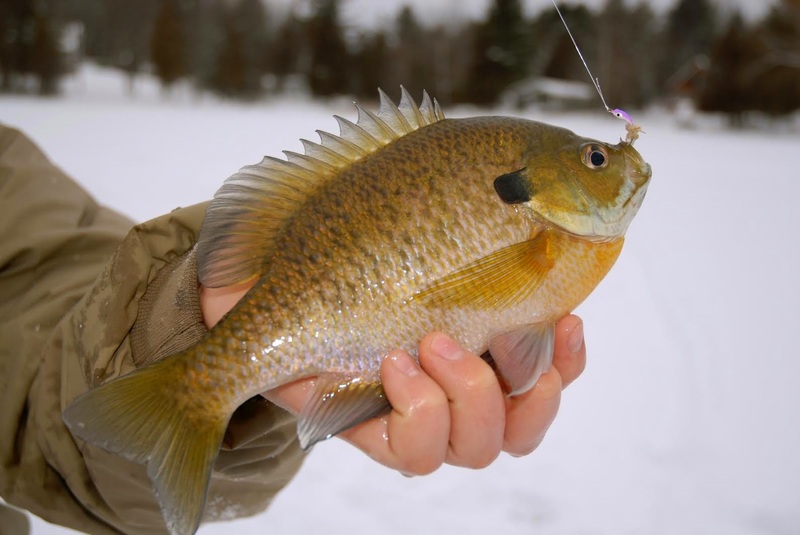 So how does all this impact on ice fishing strategies for bluegills? The moral of the story is as simple as fishing the right waters. Like a trophy buck hunter who targets only areas that produce big racked whitetails, bluegill enthusiasts must limit their fishing to the most productive waters. One of the best ways to identify these high percentage lakes is to make contact with local fishery biologists. Lakes across Michigan are routinely surveyed by the Department of Natural Resources to determine the relative fish populations. Usually trap nets are used to take fish samplings and sometimes electro shocking gear is used to census fish populations. Conservation officers are another excellent source of fishing information. 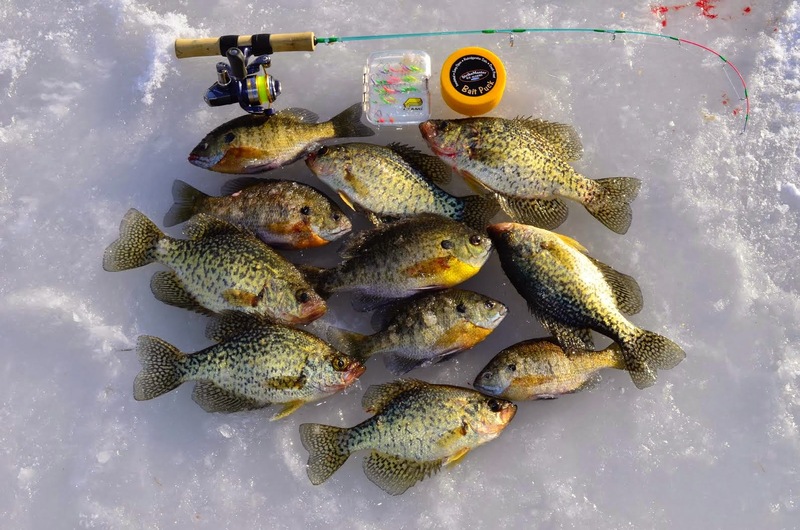 Because it’s their job to check anglers routinely, they quickly develop a feel for what waters are routinely producing good catches of panfish. I’ve yet to meet a biologist or conservation officer who wouldn’t share what he or she knows with friendly anglers who ask politely. Gaining dependable fishing information from fellow anglers, tackle shops, etc., tends to produce less dependable information and sometimes can be downright misleading. Good bluegills spots are hard to find and not everyone is willing to share that information with the competition. Even the best bluegill lake doesn’t have gills living in every water acre. In fact, the vast majority of the water mass is void of any fish at all. Compared to other popular species, bluegills are relatively easy to locate. This is because they are almost always found in association with the weed growth that provides a food source for their favorite foods. In general, the deepest water that supports ample weed growth is going to hold greatest concentrations of bluegills and also the largest fish. Occasionally bluegills are found in areas void of weed cover. In the absence of weed growth, mucky bottom areas that harbor a wealth of burrowing style aquatic insects can also hold surprising numbers of fish. Unfortunately, these areas are most often sprawling flats and the bluegills using them are also spread out and more difficult to locate in concentrations. The magic water depth for bluegill fishing in December in January is usually between 10 and 15 feet. In some lakes that have murky water and limited light penetration, good fish can be had in slightly less water. Knowing that bluegills are going to be found on soft bottom areas, in or near weed growth and in water usually less than 15 feet deep eliminates a ton of unproductive spots. By consulting a good paper fishing map or better yet and electronic GPS mapping unit, it’s possible to literally point your finger at the best fishing spots. The value of these highly detailed electronic fishing maps can’t be overstated. Not only do they allow anglers to identify potential fish holding regions within a particular body of water, while actually fishing these maps confirm that your location is the same as that you’re targeting on the map. With the help of electronic maps and a GPS mapping unit it’s rather easy to identify and visit high potential fishing spots. At this point it’s a matter of doing a little fishing to see which spots are are actually holding fish. A GPS unit is a shortcut to locating good potential fishing spots, but pinpointing actual concentrations of fish boils down to cutting lots of holes and fishing to see which spots on the spot are most productive. Bluegill fishing is always the same. It’s amazing how moving just a few feet can and often does make all the difference. The only way to find these critical spots is to put in your time, drill lots of holes and seek them out with determination. The only thing worse than not being able to find fish is finding fish and not being able to make them bite. This is the very reason that quality sonar and video electronics are so critical to ice fishing success. All the effort that goes into finding fish can be for nothing if you can’t seem to catch the fish you’ve found. Two pieces of fishing equipment can insure that anglers maximize their fishing efforts. Video cameras are very useful for confirming the presence of weed growth, soft or dark bottom areas and also fish. A video unit is the only practical way of confirming both the species of fish and general abundance. Video units can also help anglers determine the relative mood of fish, how they are reacting to various lures, lure colors and bait options. The color flasher unit is the second must have tool for winter bluegill fishing. While the video will do a lot for anglers, these units take time to set up making them a little less practical for run and gun fishing efforts. Color flasher units have the advantage of allowing the angler to view weeds, fish and his lure on the screen all at the same time. The observant angler can determine a lot by watching his flasher unit closely. For example, when fish appear on the screen it’s a simple process to position your lure just above the fish. If the fish are in an active mood, wiggling the bait while lifting it in the water column will usually stimulate a strike. If fish are not willing to bite this aggressive fishing presentation, it’s time to slow down the lure movement and use a “dead stick” approach with the bait sitting motionless just above the fish. These two fishing presentations represent the extremes on either end. On any given day the fish may react to the aggressive approach, the dead sticking approach or a level of jigging activity somewhere in between. It’s up to the angler to determine which presentation is the most productive from day to day. TEAR DROPS OR HORIZONTAL JIGS? In recent years the introduction of bluegill sized ice fishing jigs have taken the ice fishing scene by storm. Somewhere along the line anglers got the idea that a horizontal jig produces better than a vertical tear drop. This simply isn’t true and a lot of anglers are missing out on some of the fishing benefits vertical style tear drops provide. The fact is, both a vertical and horizontal presentation are effective ways to target winter bluegills. Which is best on any given day is something only the bluegills can determine. The best advice is to come prepared with multiple rods rigged with both vertical and horizontal jigs and experiment with each daily. Often the type of tear drop that produces best will change as light conditions change. Having both rigged and ready to go allows anglers to make the switch quickly without sacrificing critical prime time fishing opportunities. Every bluegill angler who has ventured out onto the ice has undoubtedly learned that dawn and dusk are the key times for catching these fish. In early winter bluegill are more likely to bite outside of these prime times, but the majority of the fish taken are still going to come during the first and last hour of daylight. 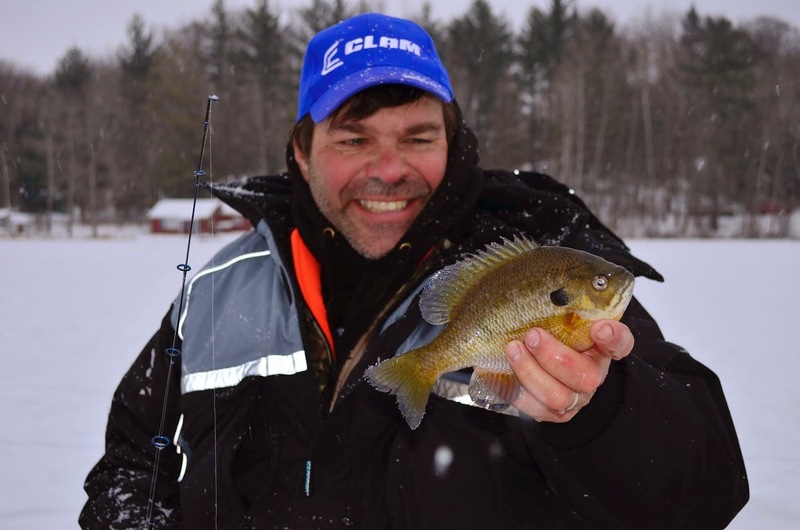 On first ice, bluegills tend to feed actively for a couple hours on each end of the day. As the winter progresses -- light penetration decreases, oxygen levels decline and vegetation dies,-- forcing bluegills to become more lethargic. This is represented in the fact that their active feeding periods become shorter and shorter. The best advice is to fish at prime time and to be organized and fishing effectively when the bluegill are most likely to be biting. comfortable while chasing bluegills on the ice. Over the years I've watched as ice fishing rods and reels have gotten better and better. 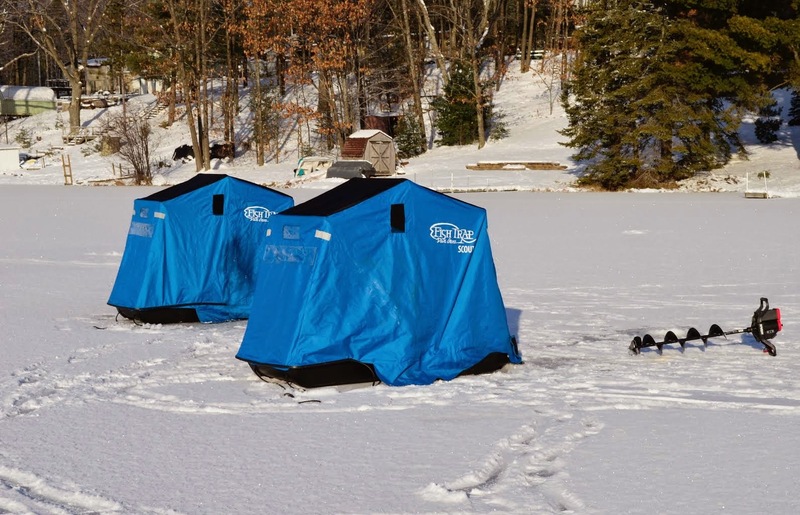 I’ve also noticed that more and more anglers are using shorter ice rods designed for fishing inside shanties. There is little doubt that a short rod is essential for fishing inside a shelter, but for those anglers who fish in flip-over shelters/windbreaks or simply in the open air, a somewhat longer rod has many advantages. A longer rod with a more sensitive tip helps to detect very subtle takes, especially from fish that eat the bait and then move upwards in the water column. These longer rods are also more enjoyable when fighting fish. Should the angler hook a larger non-target fish like a pike or largemouth bass the longer rod gives him or her a fighting chance of landing that fish. With short rods hooking a non-target fish often ends in the line breaking and a productive tear drop or jig being lost. A rod in the three foot range is just about perfect for winter bluegills. Match up this rod with a small spinning reel loaded with one or two pound test monofilament line. Wire rod holders are handy for supporting these rods above the ice when dead sticking. MAGGOTS, WAX WORMS OR SPIKES? Every time bluegill anglers share a cup of coffee the talk eventually turns to which live baits are the most productive. The overwhelming most popular choice is the common wax worm available at literally every bait shop where bluegills are a common target species. There is little doubt that a fat wax worm is a major enticement for bluegill fishing. The problem with wax worms is they are fairly large and when combined with a tear drop or jig create a somewhat bigger presentation. When bluegill are lethargic or inactive, a smaller overall presentation will usually catch more fish. Maggots and spikes are smaller than wax worms and provide an important alternative. Also, by doubling up with maggots or spikes, an angler can make the overall presentation small or large. Again the rule of thumb is to come prepared with at least two live bait options and experiment to see which are the most productive from day to day. mixed bag of crappie and gills is plenty of fish to feed two people. The final element in a winter bluegill fishing strategy is to determine which fish to keep and which ones to release. Just about everyone who enjoys fishing for bluegills also enjoys eating them. Harvest is a big part of why we target bluegills in the first place, but pushing for limit catches doesn't have to be the common denominator of the equation. In these days of increased fishing pressure, finding adult sized bluegills is becoming more difficult. Making the decision to limit harvest is one way that anglers can insure that the best lakes continue to produce good fishing action for years to come. To put it all in perspective consider that an eight inch bluegill is a four or five years old fish. In some lakes an eight inch bluegill could easily be six to eight years old! It takes a substantial amount of time to grow big bluegills. Anglers can help in this process by limiting their harvest and also by releasing some adult fish in favor of harvesting smaller and more abundant sub-adults. Letting some of the big boys go won’t feed your family or your ego, but it will make you feel like you’re part of the solution, instead of the problem.